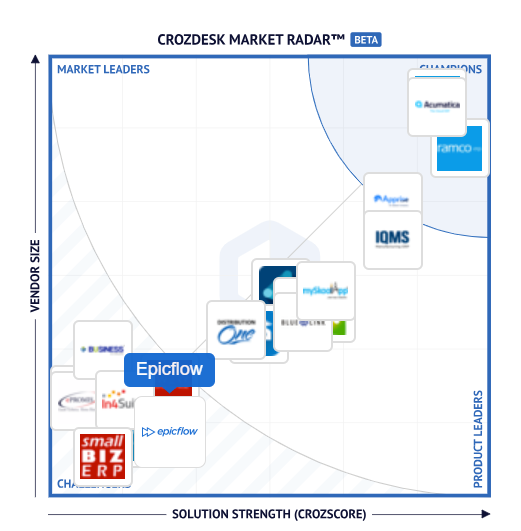 Epicflow has been ranked among the best resource planning tools by Crozdesk, a leading business software review platform. Crozdesk helps business leaders choose the best software among thousands of apps across 200 categories. Crozdesk included Epicflow in its annual resource planning software buyer guide as a Challenger for its flexibility and fast response to changing market requirements. Crozdesk compiles their list based on AI and machine learning ranking algorithms, meaning the list is formed according to unbiased software recommendations. Epicflow is web-based resource management software available for both mobile and desktop platforms. It can be used as a standalone tool or be integrated with MS Project, Jira, or Primavera, expanding their functionality for multi-project management. In multi-project environments, project leaders deal with parallel projects that have task dependencies, a shared pool of resources, and strict due dates. Epicflow handles challenges in these complex environments and ensures efficient planning. Pipeline gives a centralized real-time view of all your projects and constraints. It indicates places that need your urgent attention with red flags. Gantt chart visualizes project timelines in real time. Resource management functionality shows which employees are in each resource group and show each group’s capacity and availability. What-if analysis forecasts the future of your project based on the current state of things. Bubble graph gives you a high-level overview of your projects. Historical load graph shows group performance, capacity, load, and output over time. Task list automatically calculates task priorities based on demand. The answers to these questions will show if your organization is meeting its objectives and will help your projects grow in maturity. According to our clients’ feedback, Epicflow allows teams to work at full capacity and achieve higher output. Our case studies show excellent results — a 200% increase in team output and a 50% decrease in lead time in just two years. Are you considering new software in 2019? Book a demo using the form below to learn how Epicflow can lead your business to higher output.